The new YotaPhone smartphone is coming. Runned by Android 4.2 Jelly Bean with additional features of rear-facing E-Ink display to enhance and appreciate the LCD display on the front of the phone. With the ability of the E-Ink's, the notifications will be display in a very little energy cost and maximize battery life. A traditional HD display in front. The YotaPhone's availability is not yet release and also it's price. So we expect to hear more about the YotaPhone this coming month or as what the YotaPhone officials will announce.. 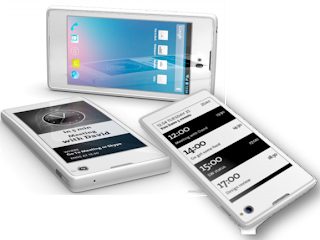 The YotaPhone has the resolution of 720 x 1280 pixels and E-Ink density of 200 dpi. It has also 4.3 Inch Diagonal and Gorrilla Glass protection. Users will be satisfied of its 2GB RAM, not bad, it can install more apps and games. Powered by 2100mAh battery and LTE Connectivity and 12MP shooter (720p front-facing unit). The Yotaphone's weight is just 140grams and less than 10mm thick. We will update you with the price and the availability of the YotaPhone, you can Subscribe or Like our Facebook Page for you to notify and for free updates.